Written by: Brittany Arneson, CMC ’16. Brittany is a Southern California native majoring in Government at Claremont Mckenna College. She has been an intern for the Office of Public Affairs for the duration of her time at CMC. Her academic interests include security studies, domestic politics, and human rights. The technology available to every citizen in our country—that puts easy, immediate communication in every person’s hand—isn’t so easily available in other places around the world. My visit this spring with visitors from the Afghan Institute of Learning, which received the Kravis Prize in 2009, provided an opportunity to understand the special challenges they face—especially with technology and communication—in improving educational resources in their country. The Afghan Institute of Learning (AIL) rebuilds education and health systems in Afghanistan through a holistic approach that combines innovative education, healthcare with health education, and quality training programs. Founded by Dr. Sakena Yacoobi, AIL benefits all needy people (70% female). It is an Afghan organization run mainly by women that seeks to help all Afghans rebuild their lives and society through transformation at the individual and community level. A collaboration between CMC’s Kravis Leadership Institute (KLI) and the Kravis Prize enabled the College to bring four members of AIL to the campus for three weeks of tailored learning. 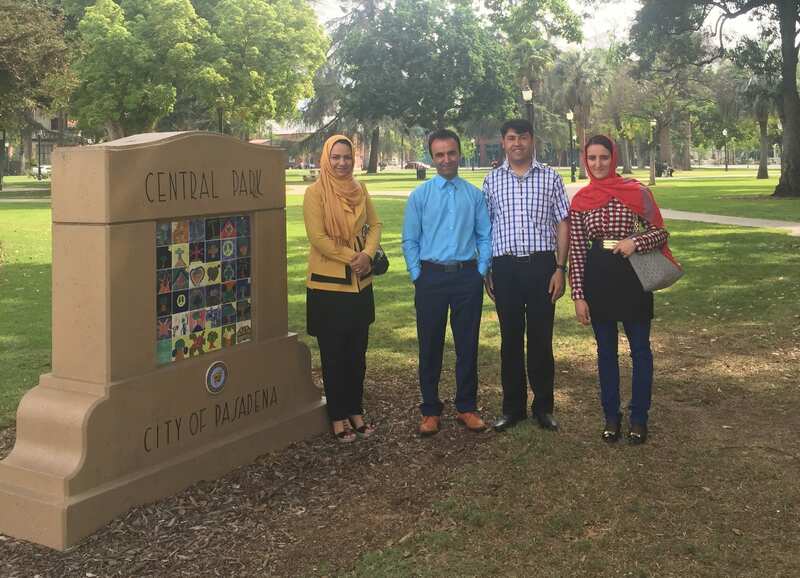 These visitors were: Ehsan Sahel, General Academic Advisor; Ali Zarin, General Coordinator; Sohaila Erfany, General Manager of AIL’s fledgling Public Radio Station; and Samana Fazilhaq, Master Teacher. This fledgling radio station is at the heart of AIL’s current efforts. Establishing the radio station in March of this year is an important step in the development of AIL, but the work of developing the radio station is still far from over. Sohaila Erfany’s work as General Manager of the new radio station in Herat highlights the communication hurdles they face. While AIL has managed to extend its impact to over 12 million people, there are many more who are unable to access their programming because of geographic issues or financial barriers. Introducing AIL’s programs through radio allows people quick, constant, and affordable access to AIL-themed leadership programs, health information, and democratic ideas. During their visit to CMC, our guests aimed to find ways to improve their organization, especially regarding media outreach via their brand new public radio station, leadership training programs, and curriculum development using alternative teaching methods. Their itinerary was jam packed, including a visit to the Southern California Public Radio Station, meetings with multiple schools where they learned about new pedagogy such as Visual Thinkings Systems and experiential learning, class visits at CMC, and conversations with various student groups. Going into my interview with them, I was unsure of what to expect. I had compiled a list of questions about their organization, their goals, and their experience during their visit. As I began speaking with our guests, I came to understand AIL as more than a non-profit organization. With a partial understanding of Afghan history and politics, I entered the interview with a rudimentary understanding of the struggles and issues most Afghans face: decades of war, social inequality, corruption, government instability, and extremism. Within this context, AIL stands as a beacon of hope and progress for Afghan people. In the end, our interview – and their visit — had a reciprocal impact on CMC. Though they traveled to CMC to learn new methods and organizational approaches, they also taught us a great deal about the nonprofit experience in their part of the world. What did we learn? Find out in the second installment of this blog post.